She’s a little older (and, conveniently, a little smaller) than I am. We’re from opposite corners of this, our native state of Indiana, but have both lived in other parts of the country for most of our lives: cosmopolitan, if, you’ll pardon the phrase. She’s an emerita professor of informatics, a consummate research librarian with more interests than can be counted, and as smart as any six regular people put together — a true “meta” thinker. Our relationship is more than a year old, but it could well be decades long. It’s a little like Toxic and Paul’s was, before they moved in together and got married (i.e., we live separately on opposite sides of the city), and it’s also very like Ghosty and Elora/Sivyaleah’s: we’re constantly in touch, mostly through Twitter. We talk about anything and everything, and never lose interest. We are, to the point, partners. We found each other online. Then the emails started… and long before we met face-to-face, she understood me as Lalo, and calls me nothing else when we’re alone. For personal reasons, she is not an avatar. But because I talk effusively about my other friends — that is, you folks — she knows how important you are, and follows many of your Tweets and blogs with respect and admiration. Me: There is a sea change going on among my SL Tweeps – most of us are “of an age”. RL becomes prevalent, but we talk about it. Emspar: Some of you are writing very powerful stuff re: RL — including ls/cm — that’s as compelling as you were writing about virtuality. It gladdens the heart. Background: Remember our noob days, when we all seemed to vow that “SL is SL, and RL is RL, and never the twain shall meet”? Maybe the younger avvies (in biological age as well as… um, closer to noob) still do that, but in my Twitter stream, blogroll, and SL friend list, there’s been a personal integration across worlds. Some of it is subtle, like Honour MacMillan… some of it is overt, like Whiskey Day, Chestnut Rau and Darkness (@Ryannetta) Tigerpaw, and some is blatant, like Crap. We get older — catastrophic or not, the vagaries of organic life become impossible to ignore. We are who we are, in pixels and flesh, and it shows. And my sweetie’s heart is as gladdened by it as my own… You see, this isn’t about her, or us: it’s about you. He proceeds to describe the activities and attitudes of each type, and to observe how each might get along with the other three. It is a long and detailed analysis — as well as revealing about the state of Second Life 3 years ago — and I recommend it. Between the definitions and the speculations on interaction between types, Bennetsen summarizes with a graph, which I reproduce here. One axis is his Immersion/Augmentation paradigm; the other introduces an Action/Interaction orientation (which I tend to interpret as “self-directed” and “other-directed”). As always — and as is proper — Bennetsen cautions: “Please still bear in mind that very few residents will fit only one of these archetypes.” The same applies to all that follows. 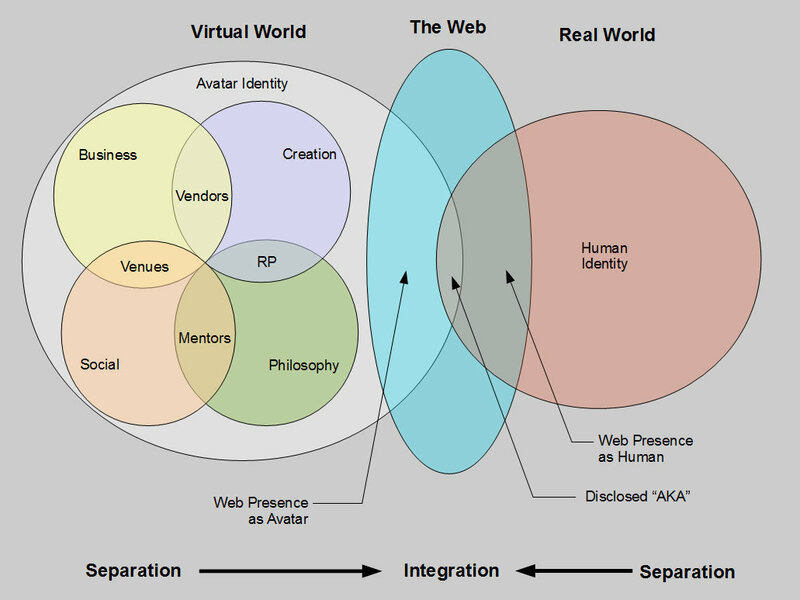 In the days since I posted “There is no wall”, and sororNishi published “Pseudonymity AKA privacy” and “Integrity”, Botgirl Questi has done some elegant and clarifying graphic analysis of issues raised in all three posts — which in turn were prompted by her post “Are Multiple Identities Contrary to a Life of Integrity”. (To paraphrase Sir Isaac Newton, we all stand on each other’s shoulders). Inspired by Botgirl’s use of Venn diagrams, I decided to make a second look at Bennetsen’s graph, including regions where archetypes overlap. Labeling the intersections was easy for three of the four. 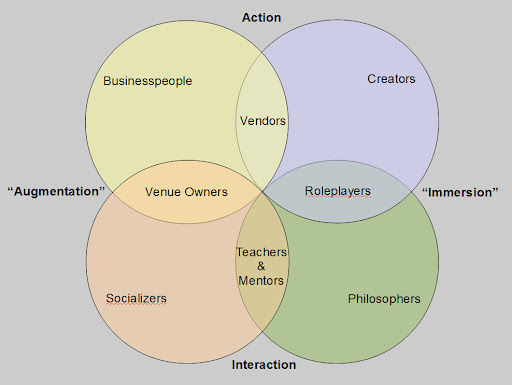 Creators who sell their virtual wares are also Businesspeople; hence, Vendors. “Philosophers” — people with a predominantly “meta” viewpoint about Second Life while in it — who are also Socializers tend to pass their knowledge along as Teachers and Mentors (whether in an official capacity or as an act of altruism). Socializers also become Businesspeople when they open a club or performance venue. This Business/Social intersection equally applies to charitable fund-raising; i.e., not all “business” is for profit. 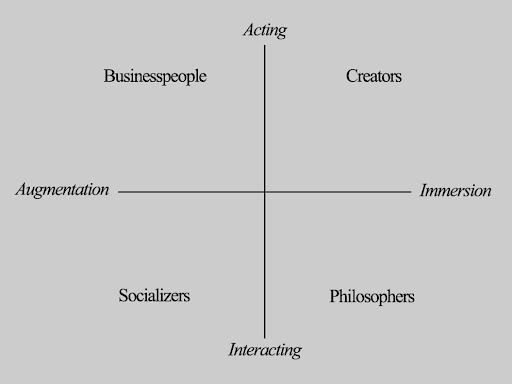 The fourth intersection, between Creators and Philosphers, was not as easy to label… but I took a clue from Bennetsen’s paper, and decided that’s where the roleplaying communities (among others) had their place. In the last few days, I’ve come to realize two important points: first, that Bennetsen’s work pertained to thoughts and behaviors within Second Life (and, by extension, to other virtual worlds that may arise); second, that my proposal for a new paradigm — Separation/Integration — took Bennetsen’s outside the enclosed psychological space of SL. Thus, it needed new words… and now, it also gets a new picture. Lo and behold, Botgirl’s Transworld theme and sororNishi’s important points about “pseudonymity vs disclosure” also reveal themselves. The only thing omitted (for clarity) is the economic “backchannel” between virtual businesses and their human owners fortunate enough to profit from their in-world activities — and, of course, between the in-world charitable funds raised and their real-world recipients. Second Life® and SL™ are trademarks of Linden Research, Inc. "InWorldz" is © InWorldz, LLC. "OSGrid" is © 2007-2010 OSGrid, Inc. a California Nonprofit Public Benefit Corporation. This publication is not affiliated with or sponsored by either Linden Research, InWorldz, or OSGrid. Telling: Like it Is by Lalo Telling is licensed under a Creative Commons Attribution-Noncommercial-Share Alike 3.0 United States License.